The story of the Lost Colony of Roanoke is a sobering reminder of how perilous a journey to the New World could be in the 16th century. Over 125 colonists from England simply disappeared without a trace. In honor of the 350th anniversary of their sacrifice, the Roanoke Colony Memorial Association was formed. 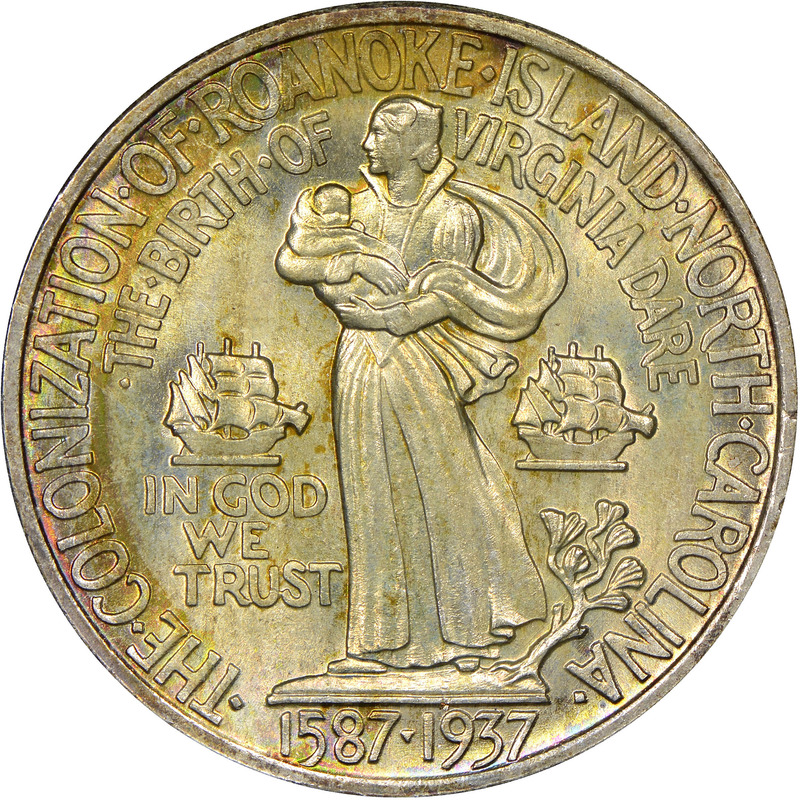 The Association petitioned Congress for a commemorative coin, and on June 24th, 1936, legislation was passed calling for no fewer than 25,000 half dollars in commemoration of Roanoke as well as Virginia Dare, the first child of English decent to be born in the New World. 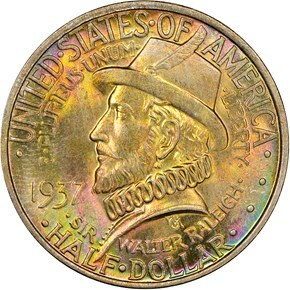 The Association selected sculptor William Marks Simpson, creator of the Antietam and Norfolk half dollars to design the coin. 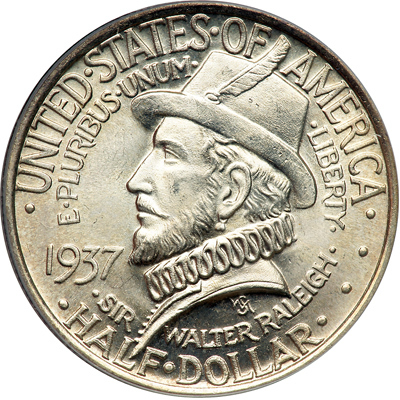 His obverse depicts a left-facing bust of Sir Walter Raleigh. To his left is the date, 1937. 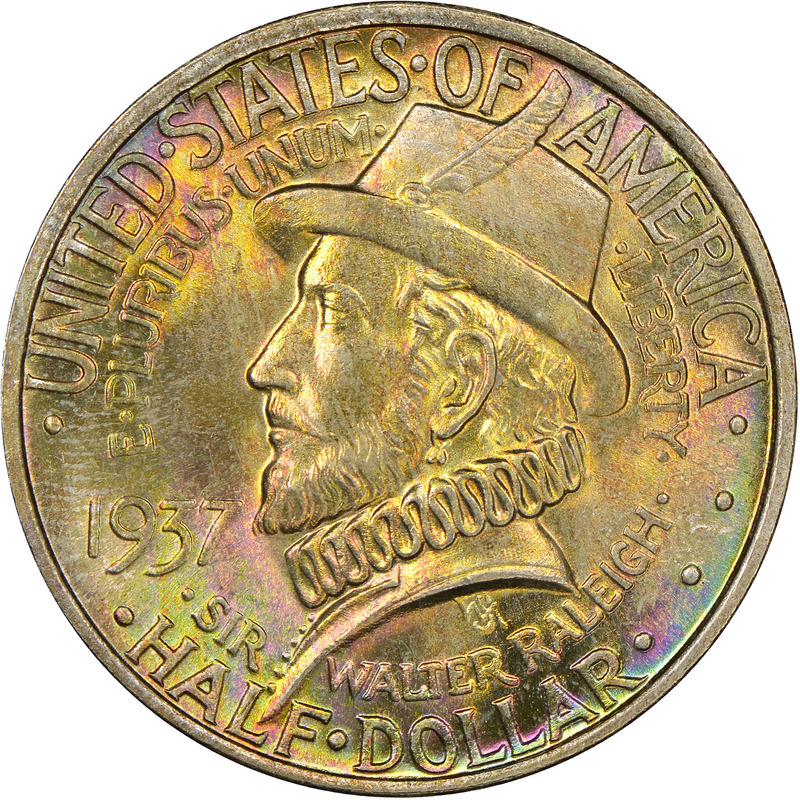 Many of the statutorily required mottos are crammed in the spaces above and around his bust, and below is the denomination, HALF DOLLAR. 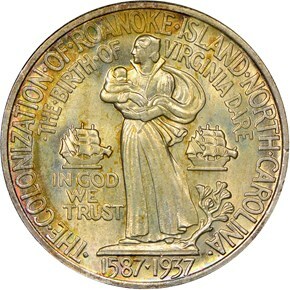 The reverse features Elinor Dare holding the baby Virginia Dare. Again, the reverse is very wordy. 1587-1937 is seen below the woman, and sailing ships flank the pair on either side. 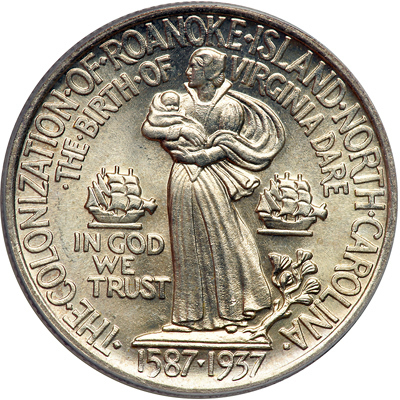 THE COLONIZATION OF ROANOKE ISLAND NORTH CAROLINA and THE BIRTH OF VIRGINIA DARE are arranged in two lines around the periphery of the coin. While there was no maximum mintage imposed on this issue, there was a provision stating that none could be struck after July 1st. There were 25,000 coins were struck in January. This was followed by 25,000 more in June, which were most likely struck due to the fact that none could be struck after the end of that month. This second order proved excessive, however, as the sale of the coins (offered at $1.65 each by mail) quickly slowed. In the end, 21,000 coins were melted, leaving a net mintage of 29,000 coins.